Christopher Carosa, CTFA has spent the better part of his career helping people do what it takes to live a comfortable retirement. He wants to help you, too. You might remember Chris as the oft-quoted President of the Bullfinch Fund and its investment adviser Carosa Stanton Asset Management, LLC. A popular and entertaining, nationally-recognized speaker, over the past decade, he has presented to thousands of financial professionals at industry conferences from coast to coast. He has appeared in, among other media outlets, The New York Times, Barron’s, USA Today and Fox Business News. In 2009, Mr. Carosa created FiduciaryNews.com, an on-line news site dedicated to providing “essential information, blunt commentary and practical examples for ERISA/401k fiduciaries, individual trustees and professional fiduciaries.” He serves as Chief Contributing Editor for the site, which in its first five years has seen more than half a million page views. Based on many of his more popular articles, his widely acclaimed book 401k Fiduciary Solutions (Pandamensional Solutions, Inc., 2012) has been called “a vital reference tool for years to come” by top financial blogger Roger Wohlner. Hey! What’s My Number? 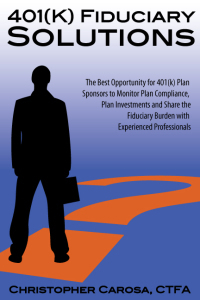 intends to do for 401k plan participants what 401k Fiduciary Solutions has done for 401k plan sponsors. Mr. Carosa has penned a total of five books. In addition to Hey! What’s My Number? and 401k Fiduciary Solutions, these include: A Pizza The Action (Pandamensional Solutions, 2014); 50 Hidden Gems of Greater Western New York (Pandamensional Solutions, 2014); A Life Full of Wonder (an unpublished novel written in 2005); and, Due Diligence (ARDMAN Regional, Ltd., 1999). He’s also authored two stage plays: Gangsters in Love (2011) and The Macaroni Kid (2007). Christopher Carosa, CTFA has accumulated a long, variegated, and successful record as a practitioner in the financial services industry. After earning a degree in physics and astronomy from Yale University in 1982, he joined Manning & Napier Advisers, Inc. During his 14 years there, he helped start the firm’s proprietary mutual fund series, created the firms custodial operations division, and created their trust company that accumulated nearly $1 billion in assets before he left. He earned an MBA from the Simon School at the University of Rochester and the CTFA (Certified Trust and Financial Adviser) professional designation from the Institute of Certified Bankers. Today, Mr. Carosa is president of Carosa Stanton Asset Management, LLC, a boutique investment firm. 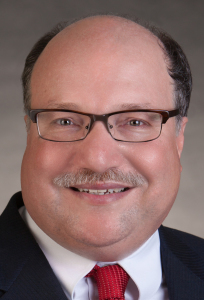 He’s also Chairman of the Board and President of Bullfinch Fund, Inc. a series of flexible no-load mutual funds, including one that concentrates its investments in Western New York companies. If you’d like to read more by Mr. Carosa, feel free to browse his author’s site, ChrisCarosa.com; LifetimeDreamGuide.com, a site to another book he’s working on; his site devoted to his first love, AstronomyTop100.com; and, a site where he, his son, and his daughter offer reviews to classic Hollywood movies, MightyMovieMoments.com.